Bad tattoos are about trying to be someone else. Postcode tattoos are about being who you are. This article originally appeared on VICE US. That's why they refer to "postcodes" as "area codes." To paraphrase Leo Tolstoy, all bad tattoos are alike; each good tattoo is good in its own way. If a successful piece of ink expresses the personality of its wearer, bad tattoos tend to fall into well-established categories. Like horror movies, they cleave close to their genre; like slogan tees, they aim to confer a sense of originality via mass production. There are the classics, like Chinese characters on a white person; there are nouveau bad tattoos, like the faux profundity of geometric shapes you’d find on a kindergarten poster, zombie pinups, or “LIVE” written in loopy script along a finger, as if you need a reminder to continue not to die. Not on this list are area code tattoos. That’s because they are the best kind of tattoo in the world. Area code tattoos seem, at first glance, to have many of the qualities of a bad tattoo. They all follow the same format: the first three digits of a phone number you associate with a formative stage, such as adolescence, usually rendered in a quality one degree worse than the rest of one’s ink. “I would personally never get an area code tattoo,” opined Reddit user Trollcommenter in a 2016 post. But they are missing out. Unlike bad tattoos, area code ink is not about trying to be someone you’re not—it’s about honoring where you’re from, the place you go to be yourself and visit your grandmother. The evidence: Wiz Khalifa, who now lives in a Mediterranean-style villa in Los Angeles, has a “412” tattoo for his hometown of Pittsburgh (Pittsburgh!). Amber Rose has “215” in chunky block letters, surrounded by Baroque fronds, for her birthplace, Philadelphia. Earlier this year, Travis Scott was shopping for a house in swanky Hollywood Hills, but his numerical ink spells out “713,” the digits for Houston. Pitbull (a.k.a. Mr. Worldwide, a.k.a. Mr. 305) has the Miami area code on his forearm, its zero rendered as the planet Earth; according to a Miami News Times list, a “305” tattoo, ideally acquired while drunk, is a sign of true Miamian identity. Area code tattoos are the bildungsroman of body art. Their near-manic local pride is not about signifying people’s journeys to the top; it’s about where the wearer began. They’re the mark of a striver who will never forget their roots. This may sound hypocritical coming from someone who doesn’t have an area code tattoo herself. 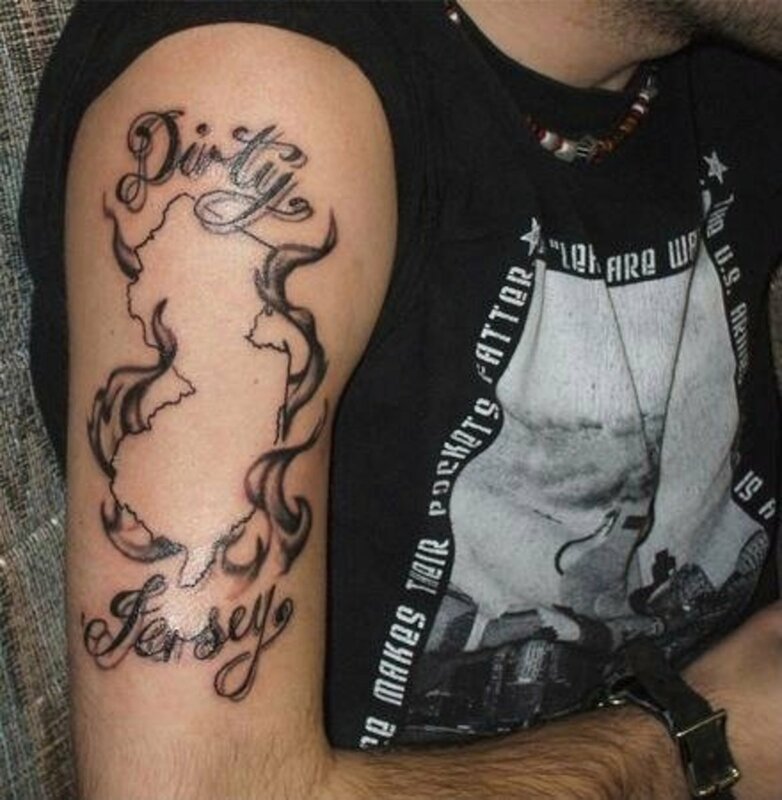 But I’ll get a tattoo for the 973—defined on Urbandictionary.com as “Jersey’s Hardest Area code” (and also “the act of jacking off into your own mouth,” but let’s leave that aside)—as soon as I find a parlor that can integrate the area code into a larger sleeve on the theme of Garden State pride. And of course, New Jersey-themed tattoos are never bad, either—no matter how many devil horns, gramophones, or Wawa logos they might contain.